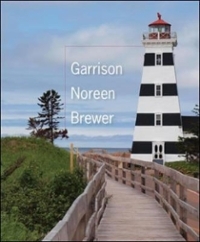 Managerial Accounting 15 Edition As the long-time #1 best-seller, Garrison has helped guide close to 3 million students through managerial accounting since it was first published. It identifies the three functions managers must perform within their organisations - plan operations, control activities, and make decisions - and explains what accounting information is necessary for these functions, how to collect it, and how to interpret it. Garrison's Managerial Accounting is known for its relevance, accuracy, and clarity. It is also unique in that the authors write the most important supplements that accompany the book: solutions manual, test bank, instructor's manual, and study guide making them both of high quality and extremely consistent with the textbook.